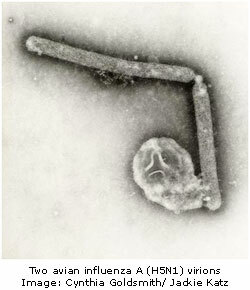 Although the recent sporadic outbreaks of influenza A virus H5N1 and of a new variant of H1N1 in 2009 were less serious than initially feared, public health responses gave an indication of the potential for pandemic influenza A to wreak havoc amongst human populations. Timely development of vaccines should help to contain future outbreaks, but effective antiviral medicines will also be needed. Circulating strains of influenza A virus with resistance to existing neuraminidase inhibitors have already been discovered, and new molecular targets would provide additional protection in the event of a fresh outbreak. Researchers led by a team at the University of Hong Kong have now identified a compound, nucleozin, which can aggregate the viral nucleoprotein and prevent its transport into the nucleus. The nucleoprotein plays critical roles in viral RNA replication and genome assembly, and nucleozin was shown to block replication of H1N1, H3N2, and H5N1 viruses in cell culture experiments and also to protect mice from lethal challenge with highly pathogenic avian influenza virus A H5N1. The study, which is published in Nature Biotechnology, shows that the nucleoprotein is a viable drug target and could lead to the development of new treatments to control the impact of future influenza A outbreaks. Potential binding sites for nucleozin on the influenza nucleoprotein were also predicted using molecular docking models. Viruses are economical with their own genetic information, relying on requisition of host cellular proteins to complete their lifecycle. In a study to identify cellular proteins required by the H1N1 influenza virus, collaborators from Howard Hughes Medical Institute, Harvard Medical School, Massachusetts General Hospital, Yale Medical School, and the Wellcome Trust Sanger Institute have now made an unexpected discovery. The research team set up large arrays of cultured human cells and used siRNA molecules to block expression of individual genes. They then examined the effect of the knockdowns on H1N1 activity by measuring changes in the presence of viral protein on the surface on infected cells. The work identified more than 120 genes which were required to be expressed for H1N1 infectivity but, surprisingly, also identified a class of genes that permitted greater influenza replication when they were blocked. The proteins encoded by these genes were members of the interferon-inducible transmembrane (IFITM) family, IFITM-1, IFITM-2 and IFITM-3. These IFITMs were known to be produced at low levels in most cells, and at higher levels in cells exposed to immune-stimulating interferon, but their functions were poorly understood. Knockdown of IFITM-3, in particular, increased replication of H1N1 by 5 to 10-fold. Conversely, by over-expressing IFITM-3 the team were able to completely inhibit H1N1 replication. To the researchers’ surprise, increased expression of IFITMs also blocked the replication of completely different viruses, including strains of West Nile and Dengue viruses. Although the proteins are not effective against all viruses, the discovery could lead to new antiviral therapeutics. Further work is required to elucidate the precise mechanisms by which the IFITMs exert their effects. The study is published in the early online edition of the journal Cell. The pandemic swine flu (H1N1) virus has proved to be less lethal than originally feared but, although most infected individuals experience relatively mild and self-limiting symptoms, some patients with no previous underlying medical condition have died. An international team of researchers has now found a possible explanation of why some people develop severe pneumonia when infected with the H1N1 virus. The team profiled immune mediators in 20 patients with severe symptoms, 15 patients with mild symptoms and 15 healthy controls. A typical innate antiviral response with increased levels of chemokines IP-10, MCP-1 and MIP-1β and an absence of anti-H1N1 antibodies characterised the early response in all infected individuals, but elevated levels of IFN-γ and mediators that stimulate Th17 and Th1 responses were found only in hospitalised patients. Both critical and non-critical hospitalised patients had increased levels of IFN-γ, Th17 mediators (IL-8, IL-9, IL17 and IL6) and Th1 mediators (TNF-α, IL-15 and IL-12p70) compared to outpatients. All hospitalised patients showed higher levels of IL-17 and TNF-α than controls but only the non-critical patients showed significant higher levels of IL-17 and TNF-α than those with mild symptoms. Levels of IL-15, IL-12p70 increased exclusively in critical patients who also showed the highest levels of IL-6. Around half of hospitalised patients and nearly all outpatients tested positive for virus, with all those who tested positive having similar viral loads. Significantly higher levels of IL-13 and IL-17 were found in hospitalised patients with undetectable virus. IL6 was found to show a significant inverse association with arterial blood oxygen pressure in hospitalised patients and a similar inverse relationship was found for IL-8 in the critically ill patients. Th1 and Th17 cells form an important part of host defence against pathogens but TH17 cells have also been linked to the pathogenesis of autoimmune and inflammatory diseases. It is presently unclear whether the increase in Th1 and Th17 responses reflects a vigorous antiviral defence necessary to clear lower respiratory infection or whether the inflammatory response contributes to disease severity. Although the ability of influenza viruses to evoke an inflammatory response is well known, this is the first study to link a Th17 response to severe influenza disease in humans. The authors suggest that immunomodulatory drugs which down-modulate Th1 and Th17 responses could be used to clarify the role of these pathways in the pathogenesis of the acute respiratory symptoms shown by patients with severe H1N1 disease. “Hypercytokinemia” of specific chemokines and cytokines has previously been shown to be associated with severe and often fatal cases of human H5N1 infections. The study is published in the journal Critical Care. Nexbio have recently presented an update on their new, broad-spectrum candidate for the prophylaxis and treatment of flu, DAS181 (Fludase®) [If this link is not working, please click here]. DAS181 is a recombinant sialidase fusion protein comprising the active domain of Actinomyces viscosus sialidase and a heparin binding sequence derived from the human protein, amphiregulin, to anchor the fusion protein to epithelial surfaces. As well as delivering DAS181 to airway epithelial cells, the anchoring domain may reduce the potential for systemic toxicity by limiting systemic absorption. DAS181 has been shown to be effective both prophylactically and therapeutically against seasonal influenza virus, the highly pathogenic H5N1 avian influenza virus, and multiple strains of parainfluenza viruses. The new study showed that DAS181 is also effective against strains of influenza virus that show resistance to the neuraminidase inhibitor, oseltamivir (Tamiflu®), both in vitro and in a mouse challenge study. Unlike neuraminidase inhibitors that inhibit the viral neuraminidase, DAS181 prevents viral entry into cells by blocking binding of viral HA glycoproteins to sialic acids on cells in the respiratory tract. Cell-surface sialic acids act as entry receptors for all influenza virus A and B strains as well as for parainfluenza viruses. Antiviral drugs that target viral proteins lead to selection pressures that favour the emergence of resistant strains and it is hoped that targeting a host receptor may reduce the likelihood of resistance. Extensive, prolonged, nonclinical studies are reported not to show the development of any meaningful resistance. A study carried out in collaboration with researchers at the University of Hong Kong and Imperial College, London and published in the September issue of Antimicrobial Agents and Chemotherapy has shown that DAS181 strongly inhibits infection of human lung tissue and cells by H5N1 virus. 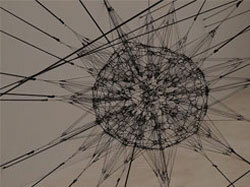 This study was also able to resolve mechanistic details of the action of DAS181. 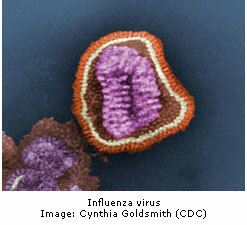 Human lung tissue and cells have two receptors that allow influenza virus to enter cells; α2-3-linked sialic acids, to which the H5N1 strain preferentially binds; and α2-6-linked sialic acids, to which the currently circulating pandemic H1N1 strain preferentially binds. DAS181 was shown to remove both α2-6-linked and α2-3-linked sialic acids found in human respiratory tissue from adjacent glycans, thereby suppressing viral entry. DAS181 is administered by oral inhalation, using a device called ‘Cyclohaler’ and is currently undergoing phase I clinical studies. Neurological complications such as encephalitis have been associated with influenza outbreaks since the middle ages but links with neurodegenerative diseases are more controversial. The association was strengthened after the 1918 Spanish influenza pandemic when some patients who developed von Economo’s encephalopathy – an atypical form of encephalitis – went on to display symptoms of Parkinson’s disease. Although a recent study showed that a reconstituted virus is not directly neurotropic, the engineered virus did strongly induce a variety of cytokines, some of which have been implicated in the pathophysiology of Parkinson’s disease. Providing new evidence for an association between influenza infection and neurodegenerative diseases, researchers at St. Jude Children’s Research Hospital, have now shown that mice that survive infection with a virulent H5N1 strain of avian influenza are more likely to show changes in the brain associated with neurological disorders such as Parkinson’s disease and Alzheimer’s disease. Using an antibody to the influenza virus nucleoprotein, the team were able to track the progress of the virus into the CNS: 2-3 days after infection, the virus appeared in the peripheral nervous system; by day 3, the virus had invaded the brain stem and, by day 7, the virus was found in areas of the midbrain including the substantia nigra pars compacta (SNpc), and the mice now showed Parkinson’s disease-like symptoms such as tremor and movement problems. Although after three weeks there was no evidence of the virus in the nervous systems of the surviving mice, inflammation in the brain triggered by the infection persisted for the entire three month course of the study. The Parkinson’s disease-like symptoms disappeared as the flu symptoms eased but, 60 days later, the mice had lost almost 20% of dopamine-producing neurones in the SNpc. α-Synuclein, a protein which forms insoluble plaques in the brains of Alzheimer’s disease and Parkinson’s disease patients, was also found to accumulate in H5N1-infected cells, including those in the midbrain where key dopamine-producing cells are located. The authors propose that a significant loss of dopaminergic neurons and long lasting immune response caused by influenza infection may worsen the effect of a second trigger, leading to increased risk of neurological disorders, such as Parkinson’s disease, later in life. The H5N1 strain used in this study is so virulent that 61% of the 433 people who have been infected to date have died and, for the survivors, it is too early to say whether they will develop neurological problems. 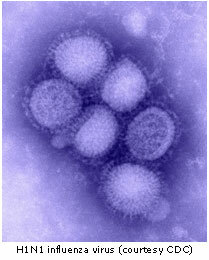 The influenza pandemic now engulfing the world is caused by an H1N1 strain rather than an H5N1 strain and, although the neurological threat posed by this virus is still being examined, early indications are that the H1N1 pandemic strain carries a low neurologic risk. The study is published in the August 10th early edition of the Proceedings of the National Academy of Sciences. Seasonal epidemics of the influenza virus continue to kill hundreds of thousands of people annually, and the increasing incidence of resistance to approved drugs means that there is a pressing need for new therapies. The viral polymerase is an attractive target for drug development and a newly reported high-resolution crystal structure of the polymerase PA domain should provide useful insights for inhibitor design. In eukaryotic cells, mRNA must be capped at the 5’-end for efficient translation. Cap structures, consisting of N7-methylated guanine units, also assist in transport of mRNA from nucleus to cytoplasm and protect mRNA from degradation by 5′ exonucleases. 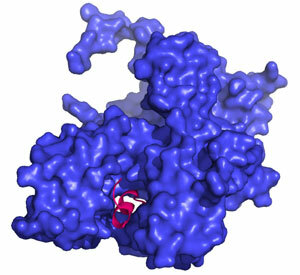 The viral polymerase ‘steals’ caps from cellular mRNA in a process known as ‘cap-snatching’ and attaches them to viral mRNAs so that these can be translated into new viral proteins. The polymerase is a heterotrimer comprising three subunits, PA, PB1 and PB2, and whilst previous studies had shown that PB2 plays a role in cap-binding, PB1 was believed to be responsible for ‘cap-snatching’. The new study, published online on February 4th in the journal Nature, clearly shows, however, that the PA subunit contains the endonuclease active site and plays a crucial role in cleaving the cap from host mRNA. The active site, which is conserved in all influenza viruses, contains a histidine residue together with a cluster of three acidic residues that bind two manganese ions in a configuration similar to that observed in other two-metal-dependent endonucleases. Inhibition of cap-cleavage by the endonuclease would be an effective anti-viral strategy since it would effectively block synthesis of viral proteins. In a study published in the 21st January early edition of the journal PNAS, a team led by scientists at the Scripps Research Institute have shown that sphingosine analogues may be able to prevent some of the lung damage caused by the influenza virus. During infection, the influenza virus directly damages lung cells but further tissue damage is also caused by the immune response that is triggered to clear the virus. T-cells and dendritic cells respond to the virus by releasing cytokines and chemokines, which in turn attract polymorphonuclear leukocytes (PMLs) and macrophages to the infected site. The cytokines and chemokines also activate dendritic cells and trigger T-cell expansion, causing further local damage. Some strains of virus, such as H5N1 (bird flu), can provoke an especially strong immune response – a ‘cytokine storm’ – in which the lungs become so clogged with immune cells that they are unable to absorb oxygen efficiently. Permanent lung damage may result even if the individual survives. In the study, mice were infected with the WSN strain of influenza and the effect of administration of the sphingosine analogue, AAL-R, directly into the respiratory tract was examined. AAL-R reduced the release of cytokines and chemokines, inhibited infiltration of macrophages and PMLs into the lungs and reduced tissue damage, even if administered 4 days after infection. Levels of anti-influenza antibodies and cytotoxic T-cell responses were unaffected, and viral replication was not increased by administration of AAL-R. In a previous study, published in the journal Molecular Pharmacology, the team showed that immunosuppression caused by local administration of AAL-R results from modulation of receptors other than S1P1 or S1P2 on dendritic cells in the lungs, and is independent of naive lymphocyte recirculation. Sphingosine analogues such as AAL-R may be especially effective if used in combination with specific antiviral drugs such as Tamiflu™ or Relenza™, to both reduce viral load and limit damage to the lung. Both bird and human flu have been in the news during December. Fresh outbreaks of bird flu have recently been reported in Hong Kong, Indonesia, Cambodia and India’s north eastern Assam state. India has also sealed off part of its border with Bangladesh amid fears that the outbreak of the H5N1 strain had spread to new areas. Attempts to determine how the H5N1 strain is evolving are being hampered by an unwillingness to share samples of the virus that would allow genetic changes to be monitored and new vaccines developed. The main problem is that there is no mechanism to ensure that the (poorer) countries that supply the samples would benefit from the vaccines developed by pharmaceutical companies in other (mainly richer) countries. Meanwhile, the Centers for Disease Control and Prevention (CDC) has notified physicians of limited data pointing to increased resistance of H1N1 strains to the leading flu drug, oseltamivir. The resistant viruses do not seem to be more virulent than susceptible ones and the CDC has said that vaccination should continue as the primary method for preventing flu. When H1N1 virus infection or exposure is suspected, the CDC is currently recommending treatment with zanamivir or a combination of oseltamivir and rimantadine rather than oseltamivir alone. Better news was reported in the 22nd December issue of Chemistry and Industry. Researchers at the University of Melbourne and the biotech company, Immuron are developing cow antibodies for the treatment of flu. 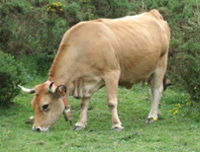 The antibodies are obtained from colostrum of cows that have been vaccinated with PR8 virus. The antibodies, which are formulated as a mouth spray, could boost protection offered by traditional vaccines, particularly in the very young or very old who are less well protected by conventional vaccines. The antibodies are claimed to have completely cleared the virulent strain, PR8, from mice, and the researchers say that the treatment could be available as an over-the-counter medicine in the next two years. Influenza A is a major human and animal pathogen with the ability to mutate and cross species: the recent emergence of the H5N1 strain of the Avian Influenza A virus has emphasised the need for new treatments. 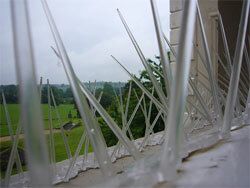 Between 2003 and 2008 there were 385 confirmed human cases of the avian H5N1 strain (WHO data). Existing flu treatments such as Tamiflu® and Relenza® target the viral neuraminidase, a highly variable protein on the surface of the virus which can mutate to give viral strains which are resistant to the drugs. Two independent reports (He et.al., Obayashi et.al.) have recently described the crystal structure of the viral RNA polymerase, a protein complex that is essential for viral transcription and replication. The complex contains three proteins, PB1 which has polymerase and endonuclease activities, PB2 which is responsible for binding capped RNA, and PA, the function of which is less clear. 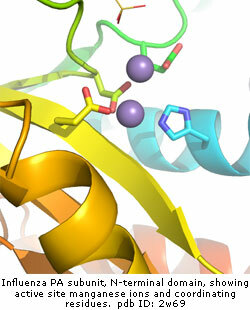 Both structures show large fragments of PA bound to a smaller helical fragment of PB1. If it were possible to devise a small molecule that could disrupt this binding, it would likely prevent polymerase activity and viral replication. Although protein-protein interactions are considered to be difficult targets for drug discovery, in this case the binding area is relatively small and offers a potential target for novel anti-influenza drugs.